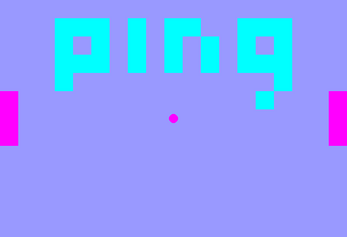 This is basically almost regular pong (aka "tennis for two"), but instead of playing pong, you go off on an unrelated adventure, where you collect these yellow things. There are 19 of the yellow things, but you only need 18 to win. Surely not the mistake of someone who didn't care to fix it. You can control this game with the arrow keys or WASD. If both is not an option for some reason, you can also use 1234. If you don't like the music, you can mute (and unmute) it with M.
Also, during development i lost a significant amount of progress due to careless overwriting of the map data, so I had to recreate the entire map. Can you find the ghost of the old one still lingering around? This game was created for FEMICOM Game Jam #4: Make cute PONG!, and is available under a Creative Commons Attribution-ShareAlike 4.0 International License. this game is based on the love2d engine. you need to download the love2d engine at love2d.org in order to play it.